How badly off are Republicans in New England? When the new Congress meets, Democrats will hold every House seat of the 23 in the region. They will hold 7 of 12 Senate seats, and 2 of the remaining 5 Senators will be independents who caucus with the Democrats. They will hold only 4 of 6 gubernatorial positions, but all 12 state legislative majorities. 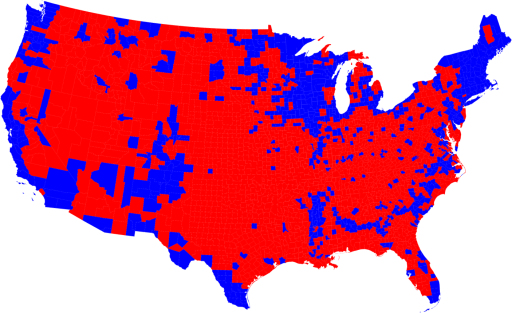 And earlier this week, Barack Obama won every New England county save one, Piscataquis County in Maine, which is that state's least populous county. Think of this: John McCain not only lost New Hampshire, but he also lost every county in New Hampshire. William Loeb would never have believed it. An overextended military. The economy in shambles. But don't worry. A brash young reformer is about to set everything straight. Yes, Ted Rall saw the big picture back in July. Will he pull back the troops in 30 days, or 60 days, or 90 days? I bet he won't. Remember, when William Bennett places bets, he really places bets. Of course Palin voted for Stevens. If he wins re-election then resigns, or wins re-election and is then expelled from the Senate, then Governor Palin gets to pick his successor. And that successor could be Sarah Palin. EDIT: the good folks at Talking Points Memo note that a vacancy would eventually be filled by special election, thanks in no small part to Senator Frank Murkowski willing the gubernatorial election in 2004 and appointing his daughter to his old seat. However, there are conflicting state laws, one of which would allow Palin to appoint an interim senator. Stay tuned. The Globe has a weekly feature entitled "What They Were Thinking" that presents the story behind an interesting photograph. 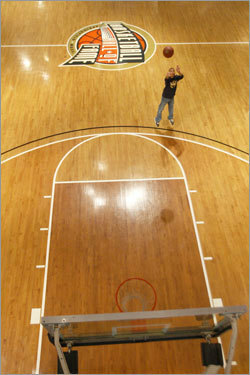 And today, it describes Mark Joe taking a 3-point basketball shot at the court at the Basketball Hall of Fame in Springfield, Massachusetts. And he is. Only the text describes "an NBA-length 3-pointer." But it is obvious that the 3-pointer is a college-length 3-pointer—the dark line of the longer 3-pointer is only a foot behind the high-school 3-point line that touches the top of the key (the semicircle above the free-throw area). The real NBA 3-point arc is four full feet behind the high-school 3-point line. I should point out that the college 3-point line was only moved out a foot in conjunction with the upcoming college basketball season. But surely a newspaper department that is devoted to basketball, and to college basketball, and to the rules of college basketball, ought to get those rules right. Imagine the mistakes that a sloppy paper makes in its political coverage, where the details are not so obvious even to the casual observer.